View/Sys/Gal: Ode " Introduction to Power Fractals" in "PowerFractals." This first section of the gallery discusses power fractals in general. The second section discusses the classic n = 2 case in more detail. 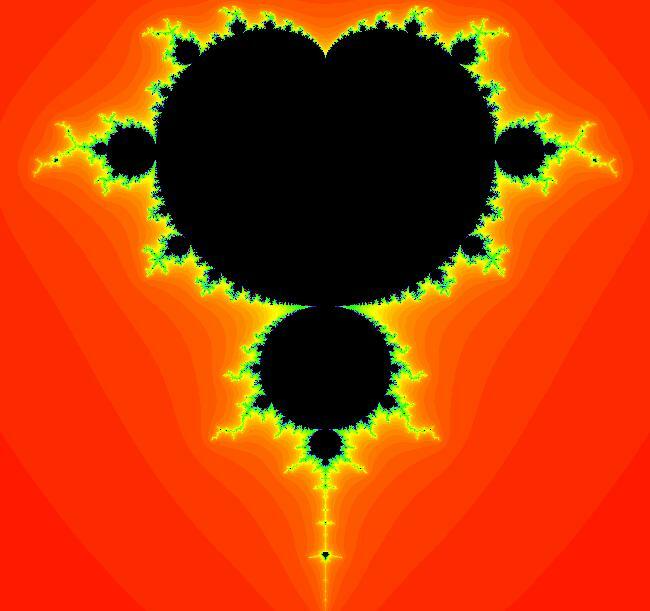 The n = 2 case corresponds to the classic Mandelbrot iteration. For each n, enter (x+i*y)^n into WA. and double click on the form that contains a single i term. This will enter it into the WA entry field which will enable you to copy/paste the plain text to any simple text editor. You should then replace each space by a * to get it into proper OdeFactory syntax. Update the system and get into the EMap view. 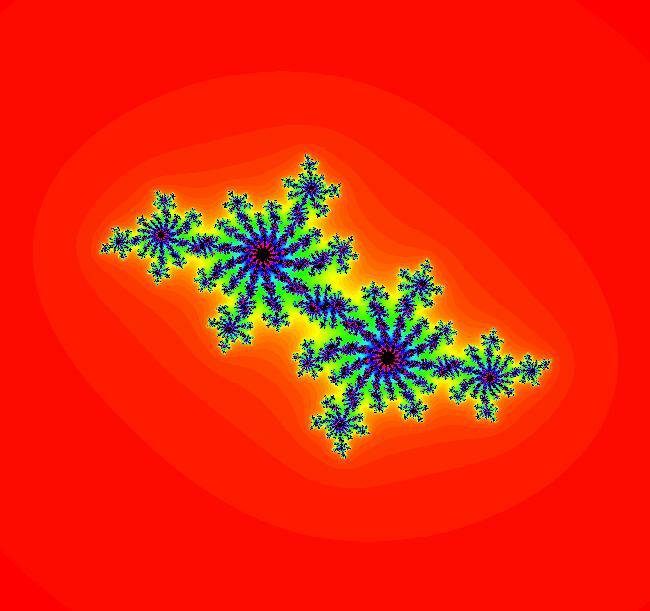 Adjust p until you get an image (a Julia set) that is not mostly black then adjust q until you get an interesting fractal. 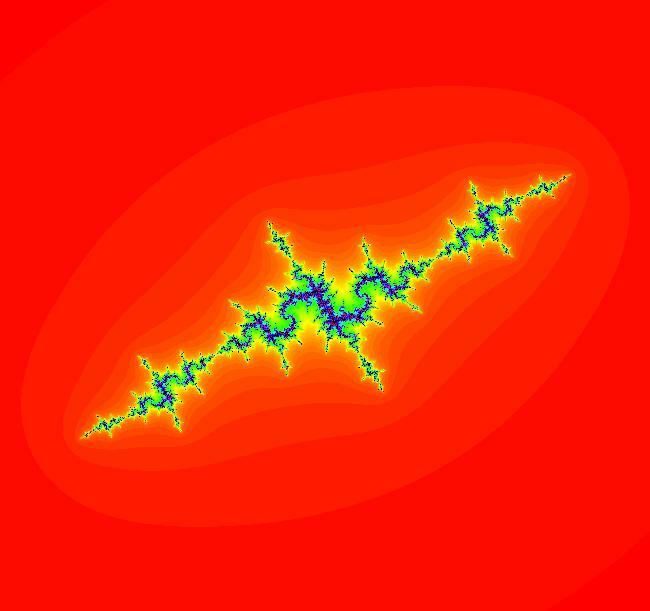 for various values of p and q.
which also gives interesting fractals called Mandelbar fractals (since z "bar" is used in place of z). 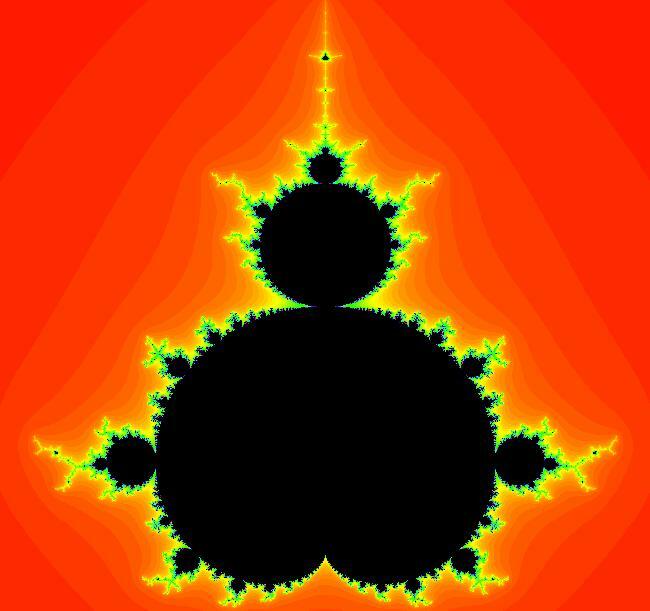 The n = 2 case of the "z <- z^n+c" iteration is the classic Mandelbrot iteration. Since all of the systems z<-z^n+c have 2 state variables and 2 parameters, I call them "2D2P" systems. It is easy (in OdeFactory) to create bifurcation diagrams for 2D2P iterated systems by creating 4D0P companion iterated systems. 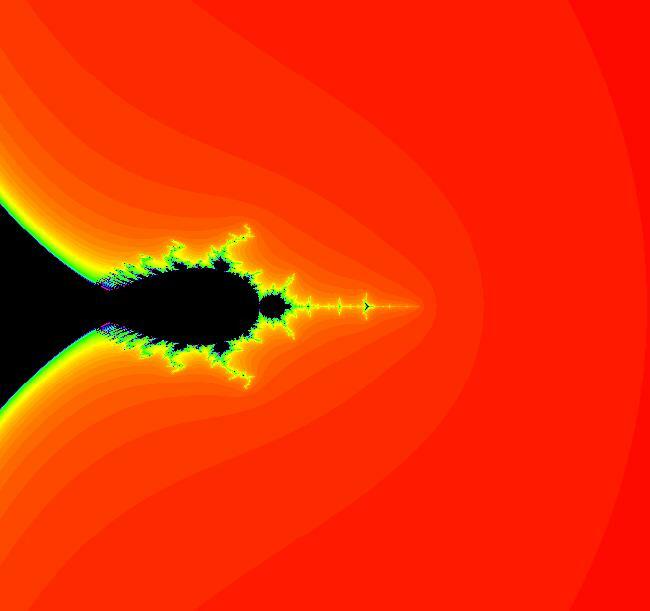 For n>2 the bifurcation diagrams could be thought of as higher order "Mandelbrot" sets. 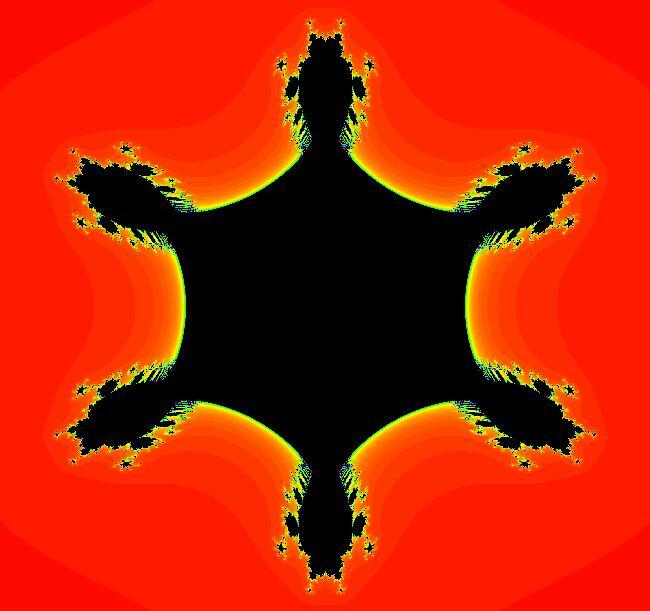 View/Sys/Gal: EMap "EMap z^2, (-(G+q),F+p)" in "PowerFractals." Click "Adj Ctrl Params..." and try changing parameter values and/or color tables. 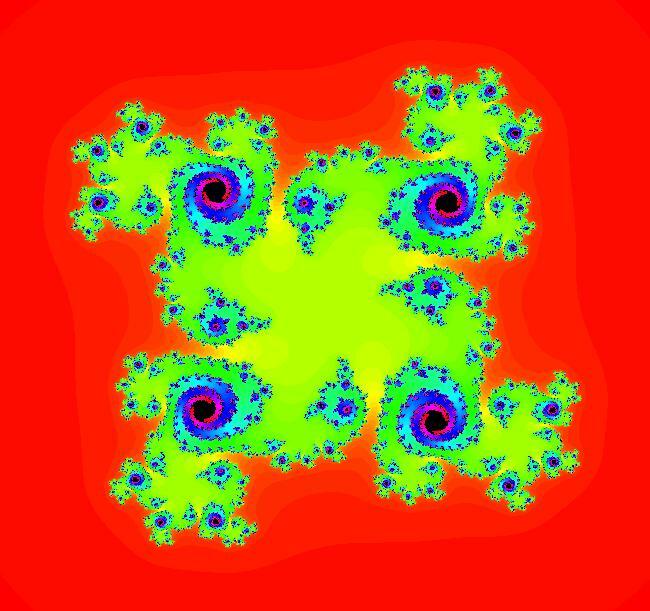 View/Sys/Gal: EMap "EMap z^2, (-G+q,F+p)" in "PowerFractals." 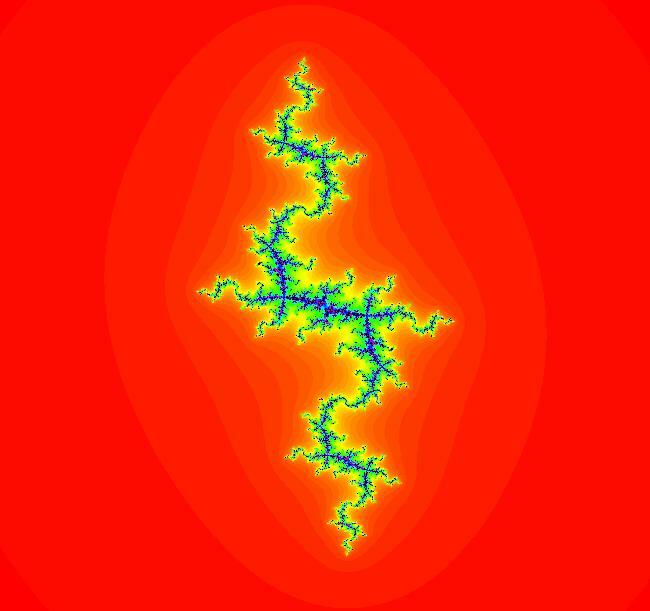 View/Sys/Gal: EMap "EMap z^2, (F+p,-G+q)" in "PowerFractals." 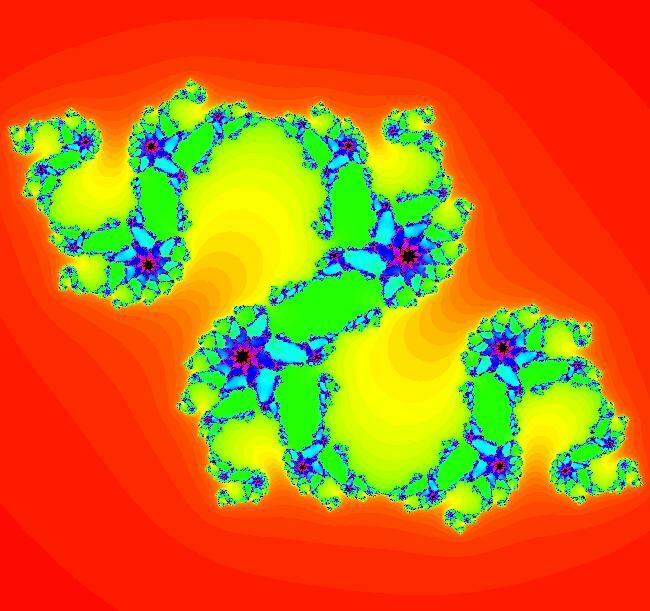 z <- conj(z)^2+c, c = p+i*q.
View/Sys/Gal: EMap "EMap z^2, (F+p,G+q)" in "PowerFractals." z <- z^2+c, c = p+i*q. 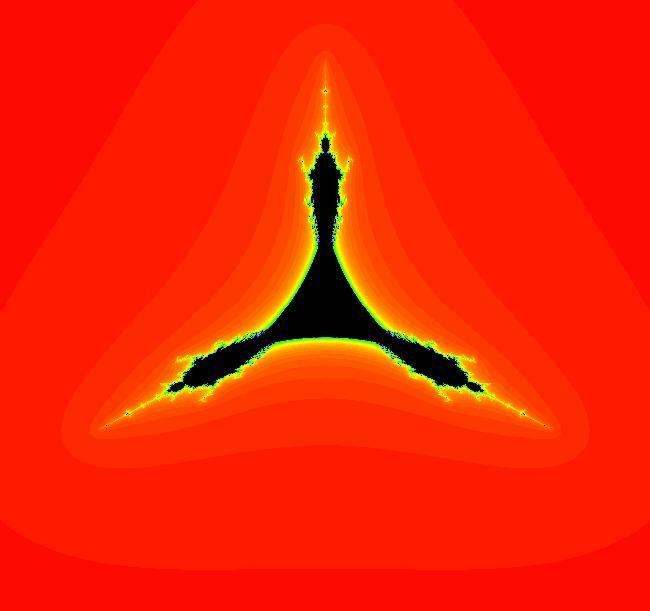 The image is called the Julia set for (p,q). Vary p and q to get different Julia sets. 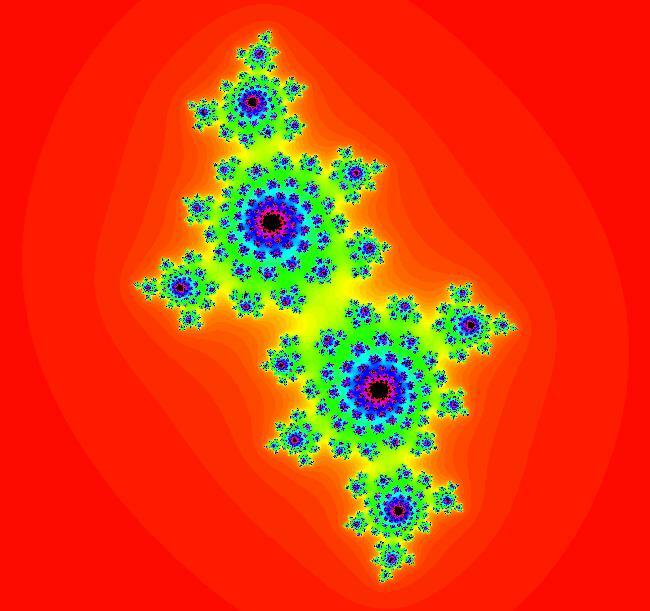 View/Sys/Gal: EMap "EMap z^2, (F+p,G+q) zoomed in at (p,q) = (.32,.5)" in "PowerFractals." (x,y) = (p,q) = (.32,.5). Image 1: Start a Flow to see the dot. 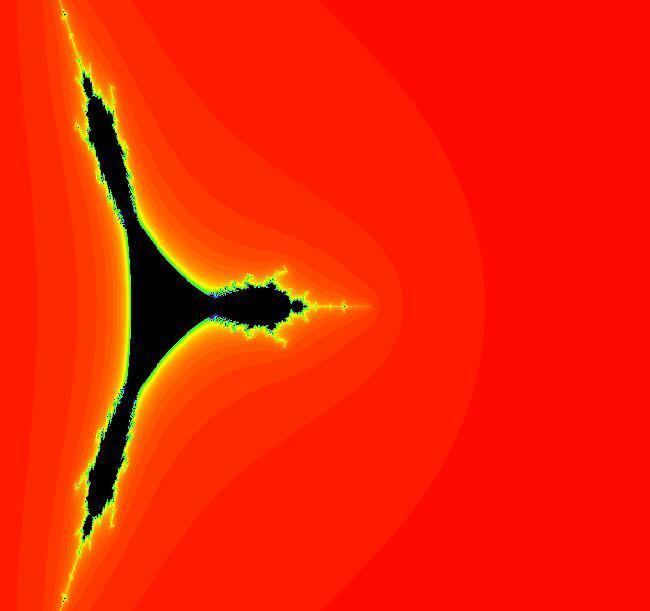 View/Sys/Gal: EMap "EMap z^2, (F,-G)'s bifurcation diagram" in "PowerFractals." 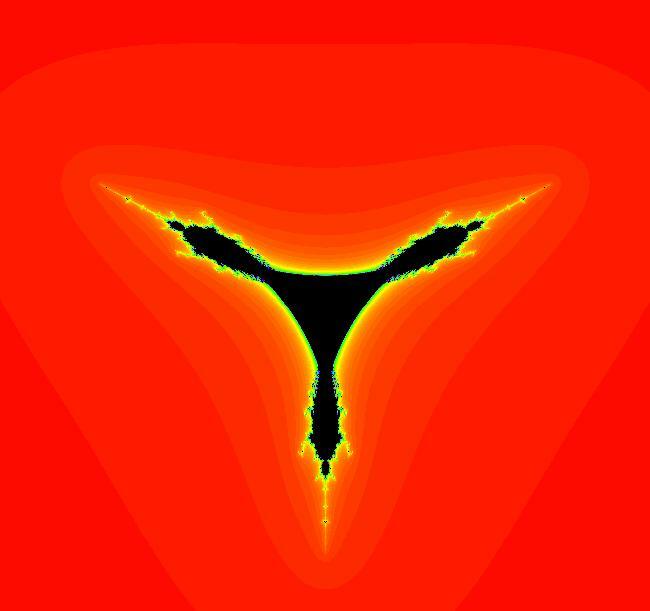 This is sometimes called the Mandelbar set. 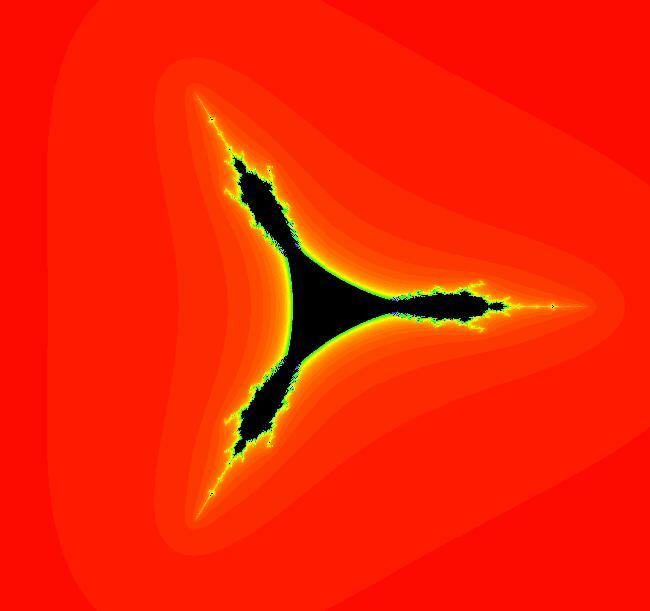 View/Sys/Gal: EMap "EMap z^2, (F,G)'s bifurcation diagram" in "PowerFractals." 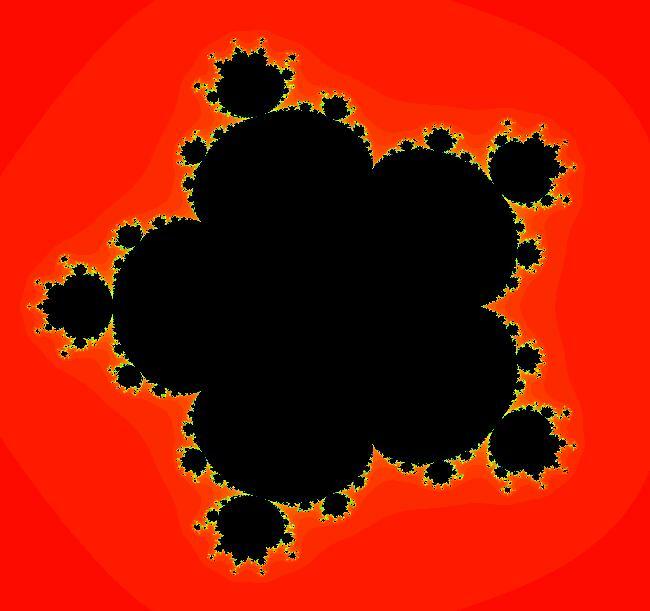 It is the classic Mandelbrot set. 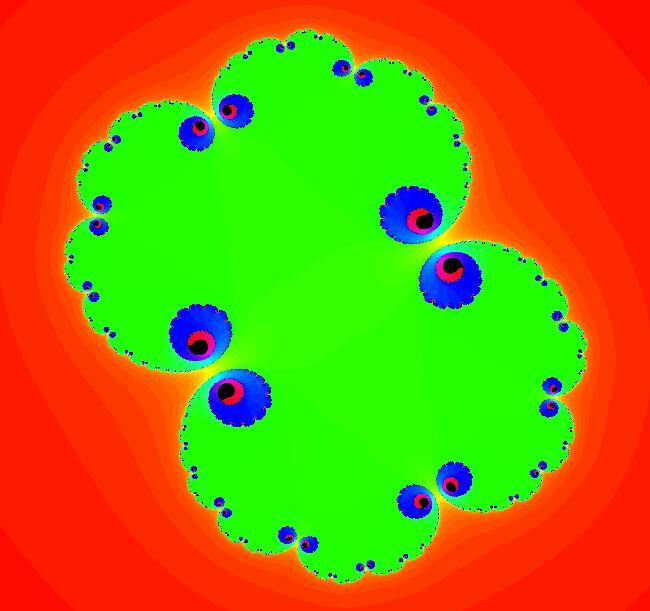 View/Sys/Gal: EMap "EMap z^2, (G+q,-(F+p)) same as (-(G+q),F+p)" in "PowerFractals." gives the same EMap and the trajectories in the Ode view just differ by a time reversal. Change the signs and update to see for yourself. 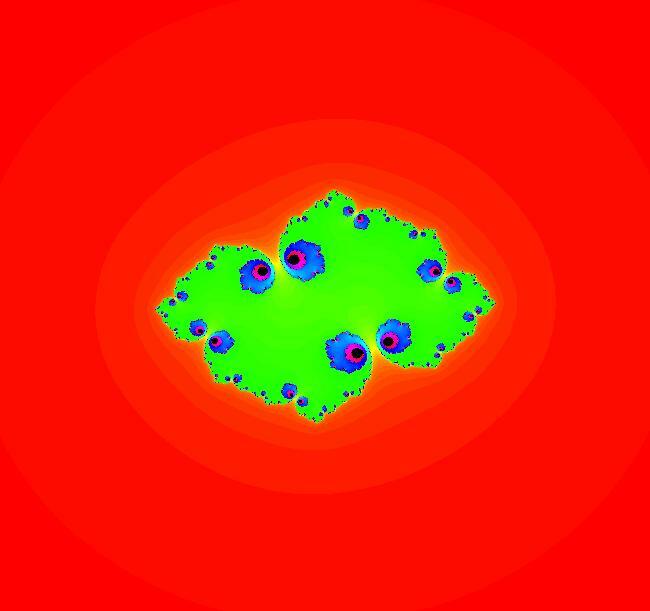 View/Sys/Gal: EMap "EMap z^2, (G+q,F+p)" in "PowerFractals." View/Sys/Gal: EMap "EMap z^3, (F+p,-G+q)'s bifurcation diagram" in "PowerFractals." 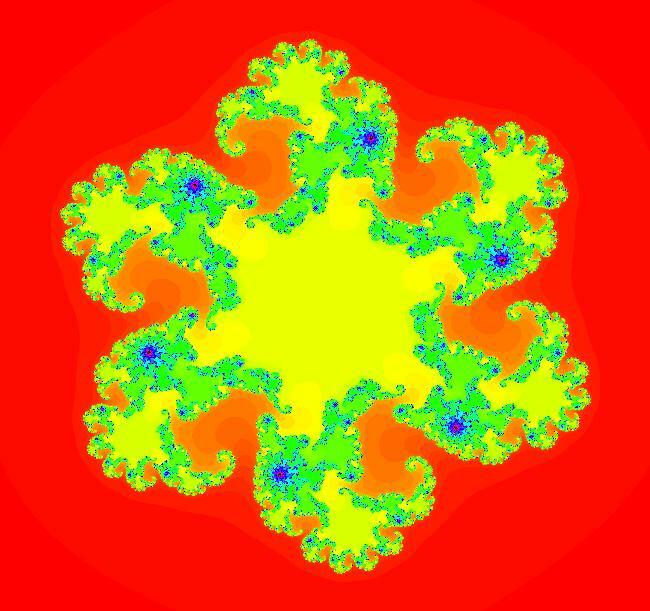 View/Sys/Gal: EMap "EMap z^3, (F+p,G+q)" in "PowerFractals." 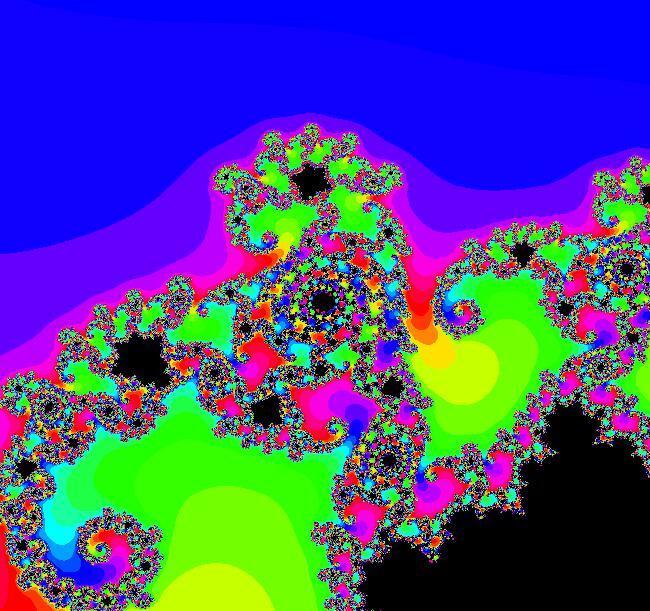 z <- z^3+c, c = p+i*q.
View/Sys/Gal: EMap "EMap z^3, (F+p,Q+q)'s bifurcation diagram" in "PowerFractals." Image 1: The entire bifurcation diagram. Zoom in on any of the small black regions to see the fractal nature of the image. Image 2: Zoomed in view. 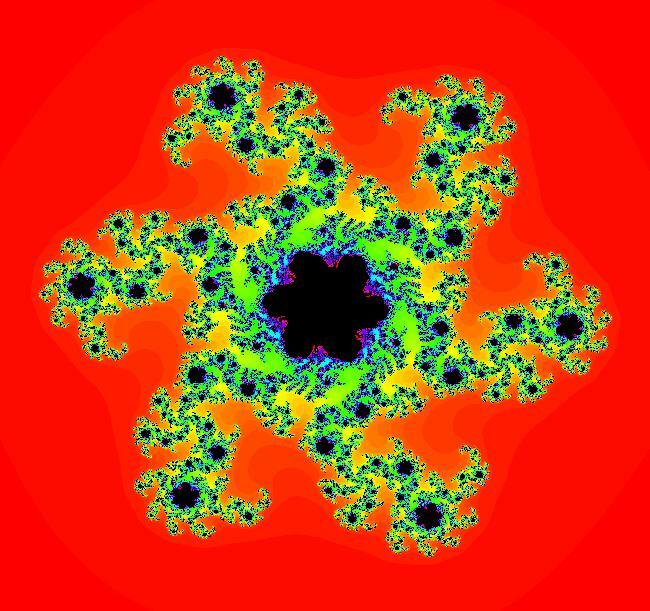 View/Sys/Gal: EMap "EMap z^3, (G+p,-F+q)" in "PowerFractals." View/Sys/Gal: EMap "EMap z^3, (G+p,-F+q)'s bifurcation diagram" in "PowerFractals." 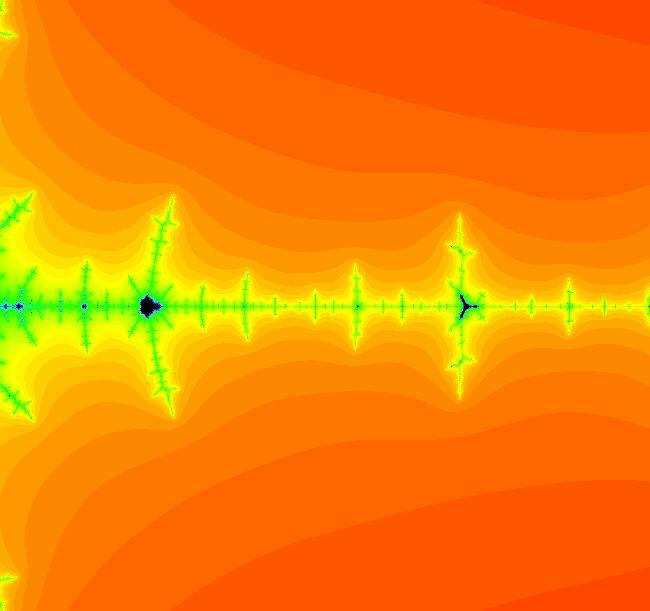 This is just the previous z^3 bifurcation diagram rotated ccw by 45 degrees. View/Sys/Gal: EMap "EMap z^3, (G+p,F+q)" in "PowerFractals." View/Sys/Gal: EMap "EMap z^4, (F+p,-G+q)'s bifurcation diagram" in "PowerFractals." 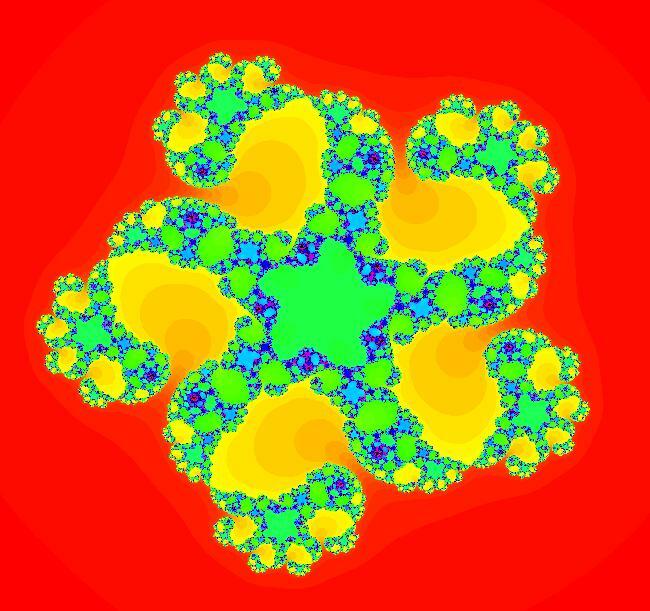 View/Sys/Gal: EMap "EMap z^4, (F+p,Q+q)" in "PowerFractals." z <- z^4+c, c = p+i*q.
View/Sys/Gal: EMap "EMap z^4, (F+p,Q+q)'s bifurcation diagram" in "PowerFractals." Image 1: The bifurcation diagram. Image 2: Centered at (x,y) = (.31886,.75000), zoomed in 4X with CT1. 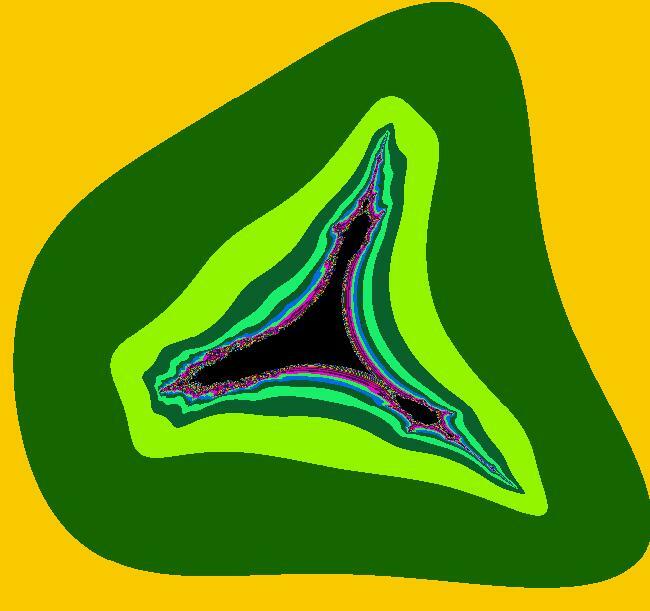 View/Sys/Gal: EMap "EMap z^4, (G+q,-(F+p))" in "PowerFractals." 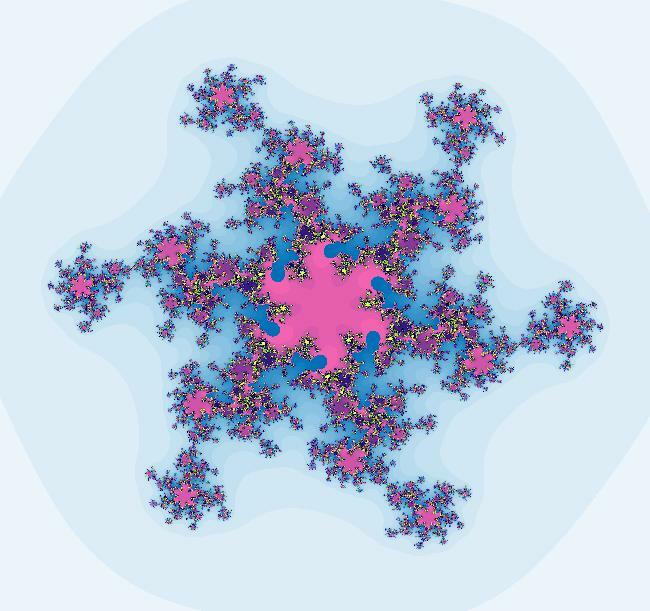 View/Sys/Gal: EMap "EMap z^4, (G+q,F+p)" in "PowerFractals." View/Sys/Gal: EMap "EMap z^5, (F+p,-G+q)'s bifurcation diagram" in "PowerFractals." 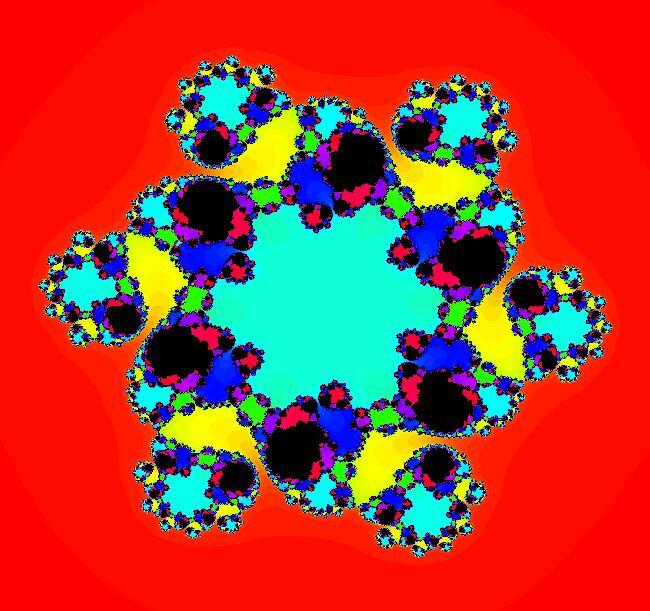 View/Sys/Gal: EMap "EMap z^5, (F+p,G+q)" in "PowerFractals." 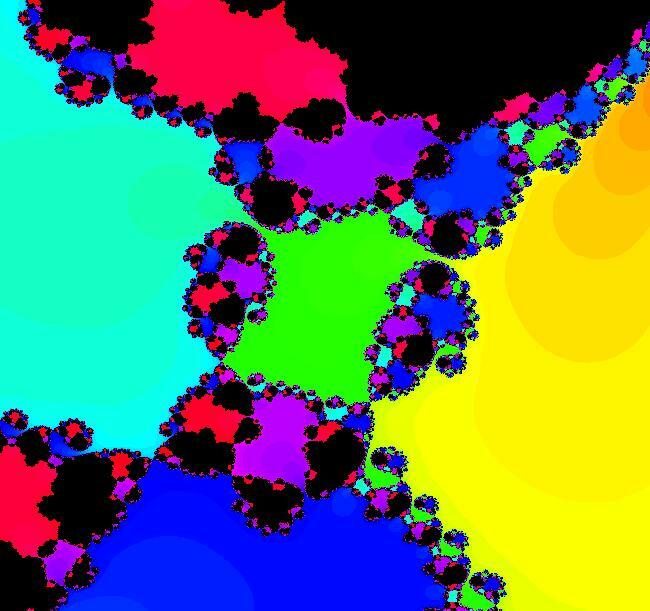 z <- z^5+c, c = p+i*q.
View/Sys/Gal: EMap "EMap z^5, (F+p,G+q)'s bifurcation diagram" in "PowerFractals." Image 2: Centered at (x,y) = (.51674,.64576), zoomed in 3X using CT3. 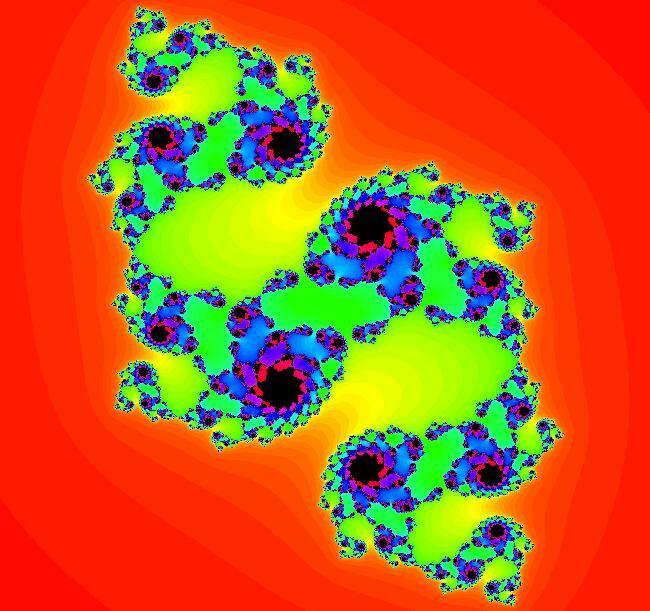 View/Sys/Gal: EMap "EMap z^5, (G+q,-(F+p))" in "PowerFractals." 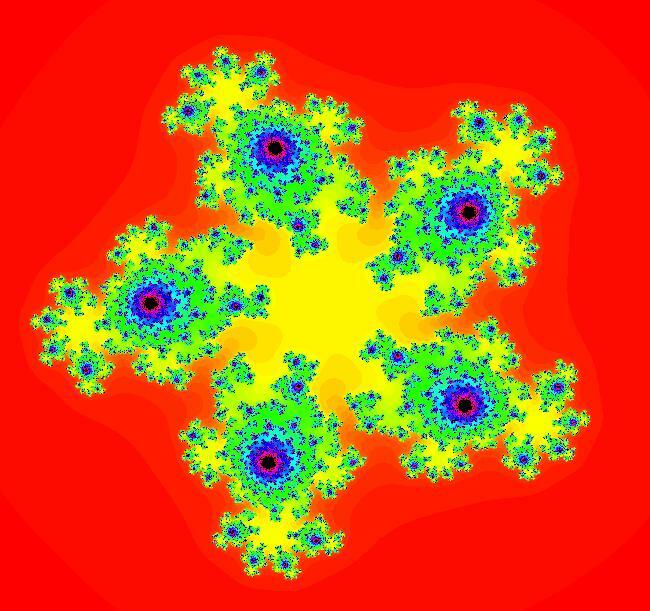 View/Sys/Gal: EMap "EMap z^5, (G+q,-(F+p)) ver 2" in "PowerFractals." 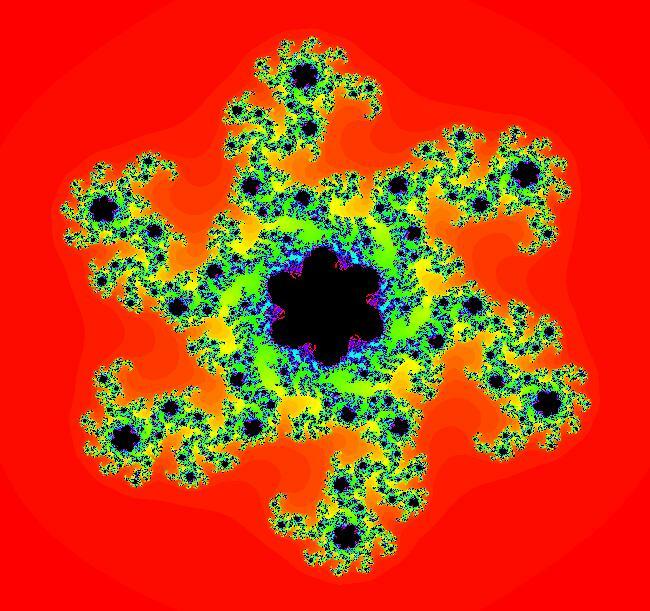 View/Sys/Gal: EMap "EMap z^5, (G+q,-(F+p)) ver 2, time-scaled" in "PowerFractals." This is the time-scaled version of the previous system. Time-scaling can be used to reduce the size of the basins of attraction (the black regions). Try decreasing s from 1 to 0. View/Sys/Gal: EMap "EMap z^5, (G+q,F+p)" in "PowerFractals." View/Sys/Gal: EMap "EMap z^6, (F+p,-G+q)'s bifurcation diagram" in "PowerFractals." 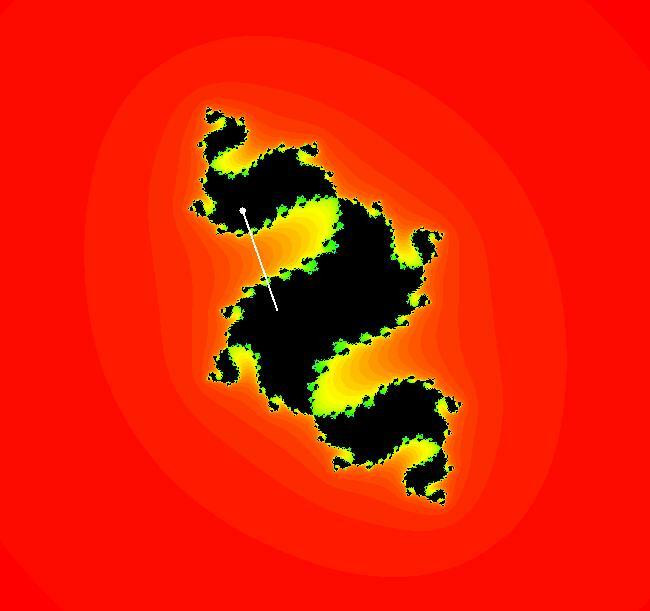 View/Sys/Gal: EMap "EMap z^6, (F+p,G+q)" in "PowerFractals." z <- z^6+c, c = p+i*q.
View/Sys/Gal: EMap "EMap z^6, (F+p,G+q)'s bifurcation diagram" in "PowerFractals." Image 2: Centered at (x,y) = (.61637,.54105), zoomed in 4X with CT1. 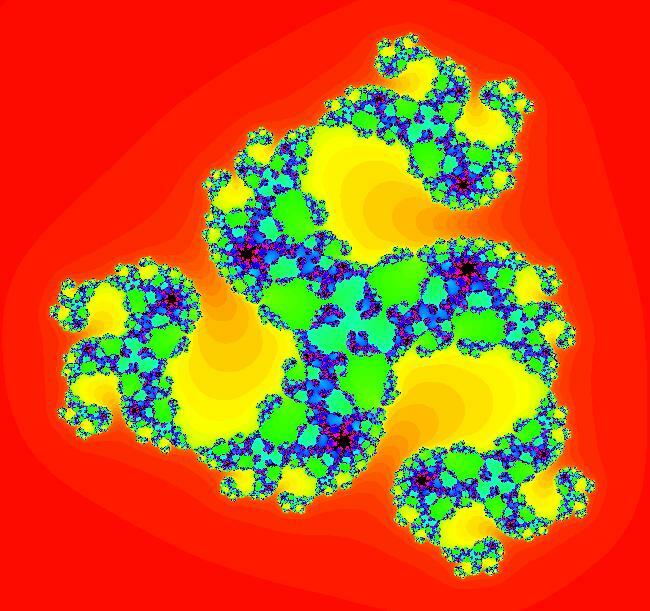 View/Sys/Gal: EMap "EMap z^6, (G+q,-(F+p))" in "PowerFractals." 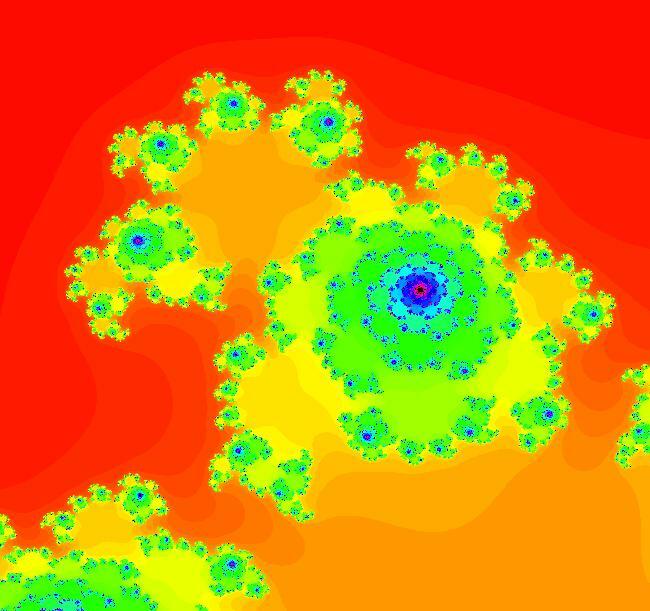 View/Sys/Gal: EMap "EMap z^6, (G+q,-(F+p)) ver 2" in "PowerFractals." View/Sys/Gal: EMap "EMap z^6, (G+q,F+p)" in "PowerFractals." View/Sys/Gal: EMap "EMap z^6, (G+q,F+p) ver 2" in "PowerFractals." This one is a bit slow to draw. It should probably be time-scaled, starting with s = 0. View/Sys/Gal: EMap "EMapCT1 z^4+c: (F+p,G+q)'s bifurcation diagram again" in "PowerFractals." View/Sys/Gal: EMap "EMapCT3 z^6, XMass 2014 Snow Flake" in "PowerFractals." Parameter s is a time-scaling parameter used to reduce the amount of black in the image. View/Sys/Gal: EMap "EMapCT5 z^6, XMass 2014 Wreath" in "PowerFractals." 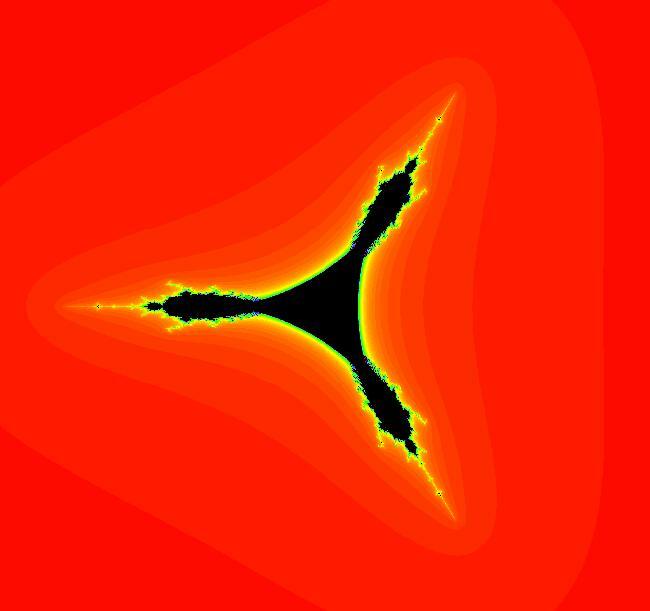 View/Sys/Gal: Ode "z^2+c: Bifurcation Diagrams" in "PowerFractals." "z <- z^2+c," for z and c complex. 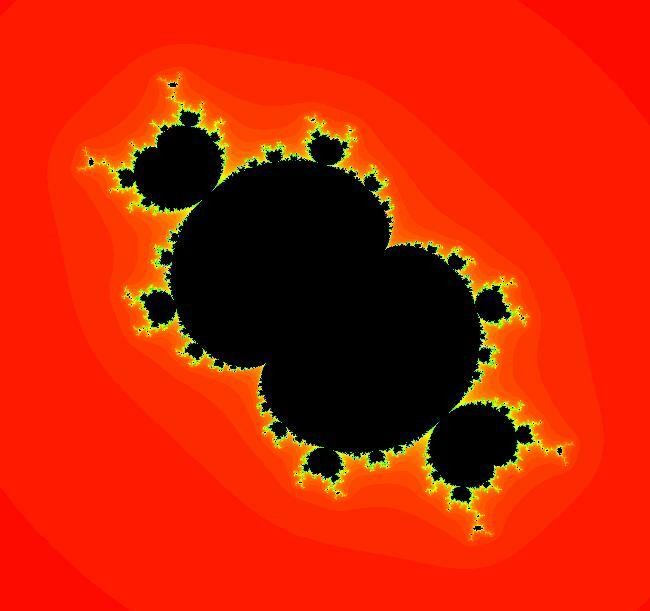 The variations with an asterisk give a 3-sided variation of the classic Mandelbrot set with a 120 degree rotational symmetry. 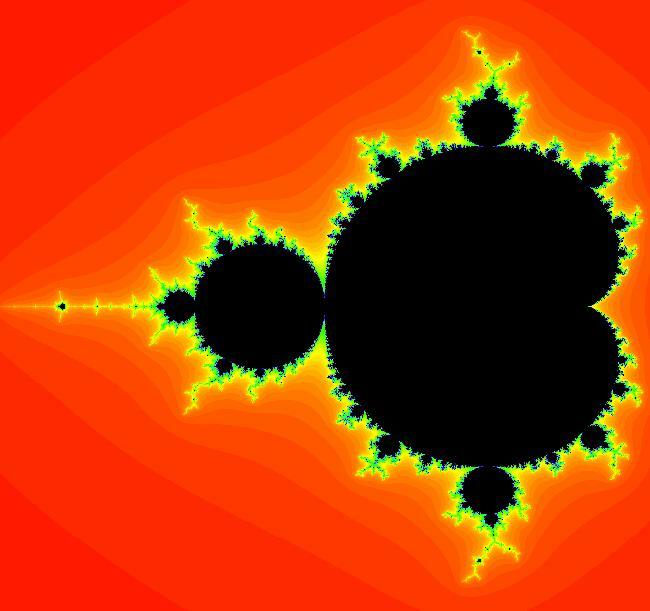 The classic Mandelbrot set is symmetric about the long axis. 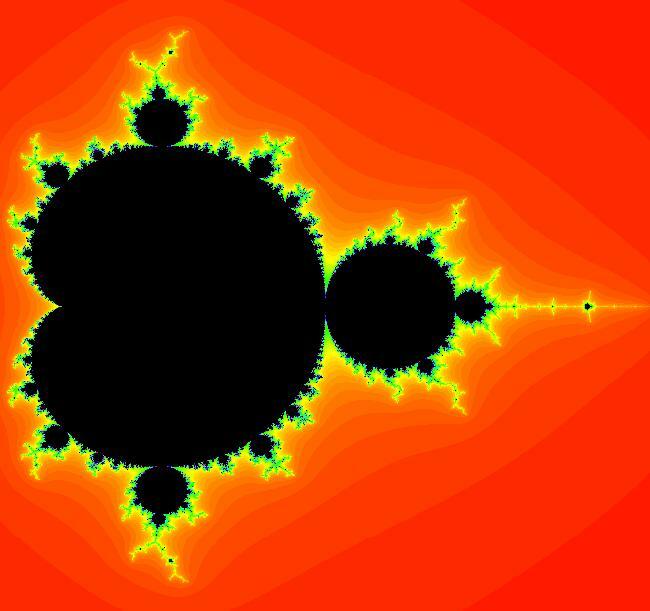 Bifurcation diagrams 1, 4, 6 and 7 are topologically the same and are the Mandelbrot set. Bifurcation diagrams 2, 3, 5 and 8 are topologically the same and are the Mandelbar set (they use z bar in place of z in the iteration). 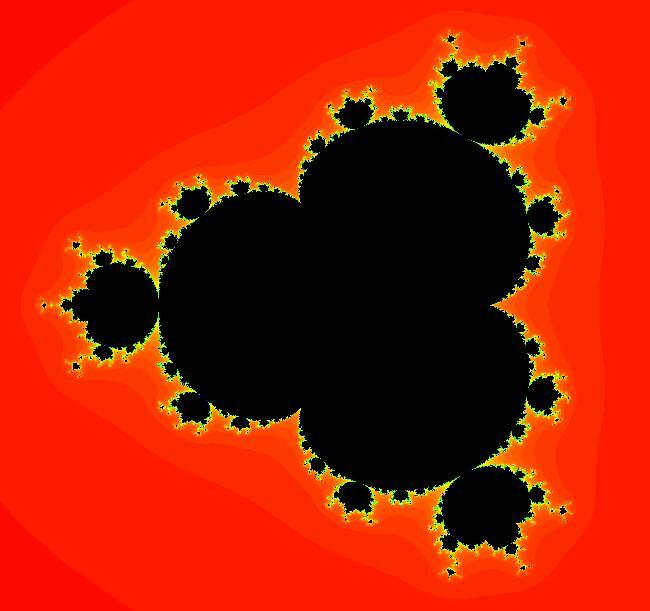 The Mandelbar set contains regions quasi-similar to itself and to the Mandelbrot set. 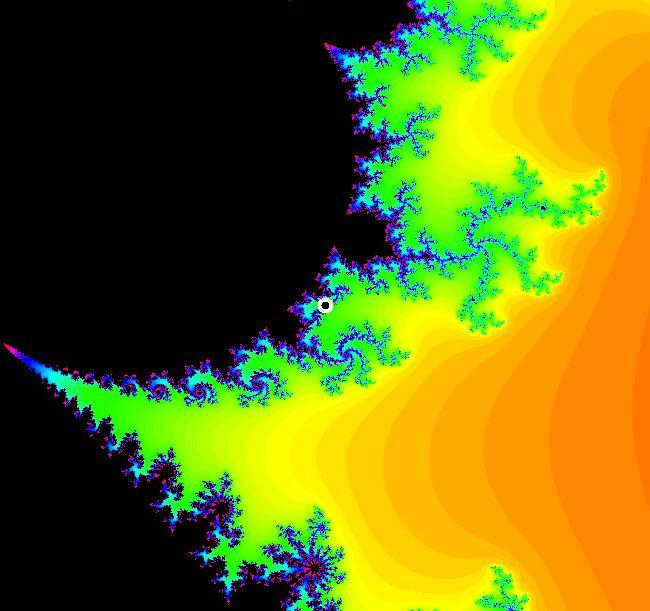 View/Sys/Gal: EMap "z^2+c: (1J) (F,G) EMap" in "PowerFractals." 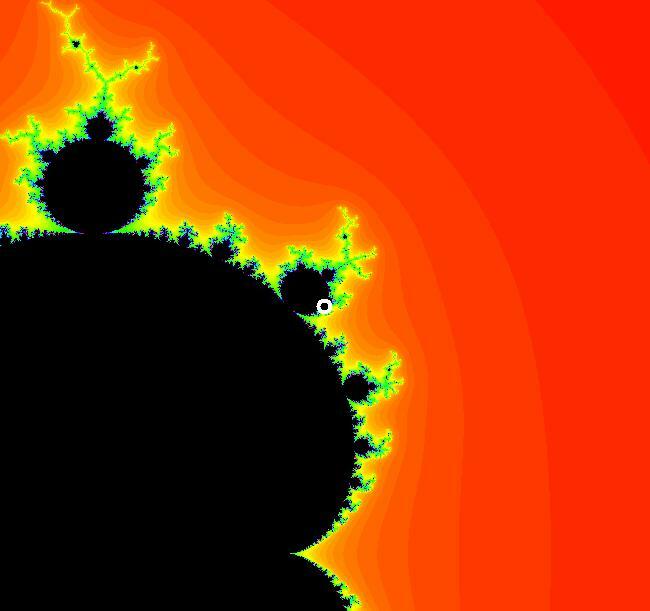 View/Sys/Gal: EMap "z^2+c: (1M) EMap" in "PowerFractals." 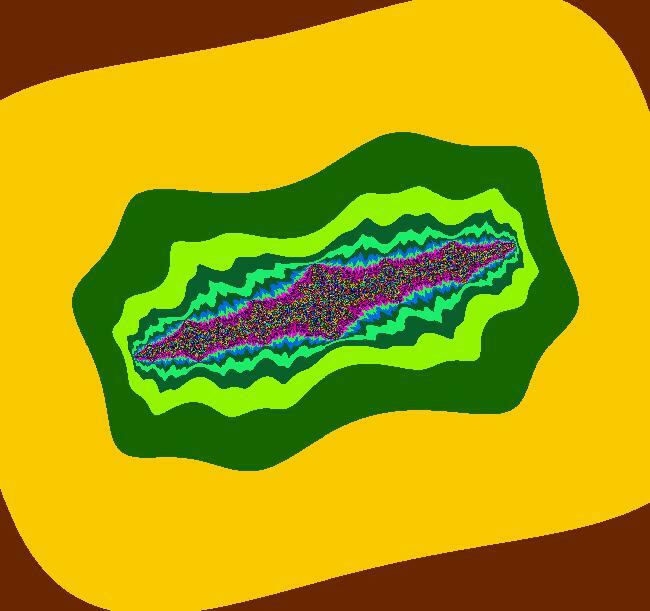 Start a Flow to see (p,q). 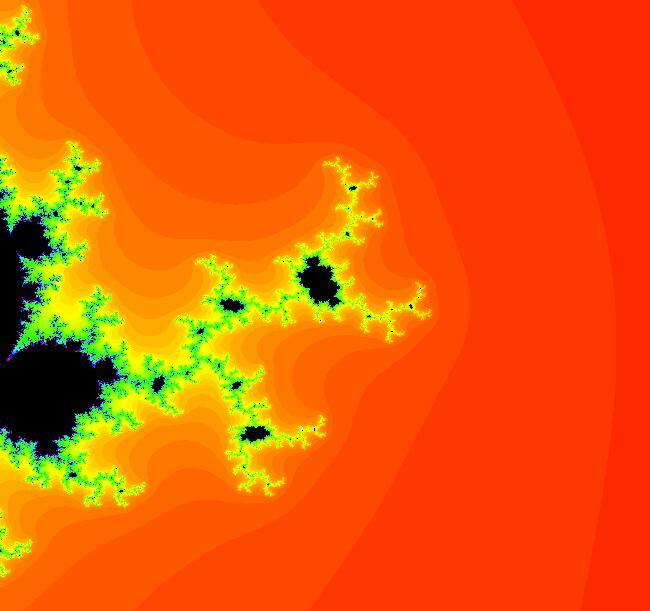 View/Sys/Gal: EMap "z^2+c: (2J) (-F,G) EMap" in "PowerFractals." The black region is a basin of attraction. The attractor is the 2-cycle shown by the white line. 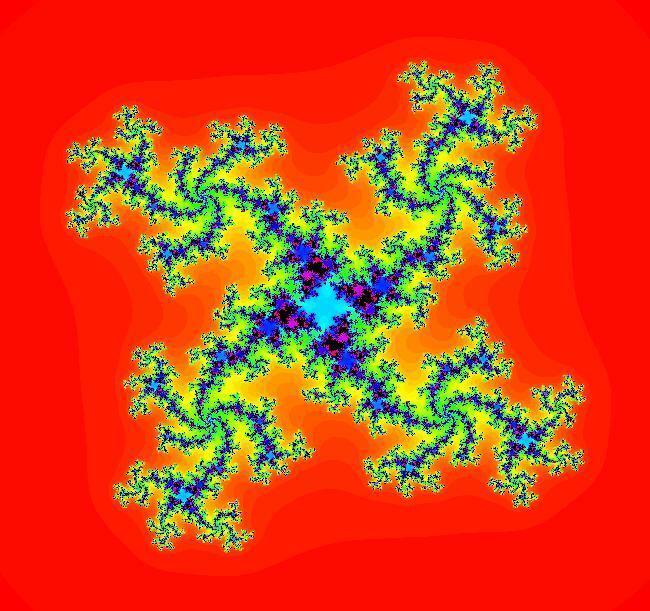 View/Sys/Gal: EMap "z^2+c: (2Mbar) EMap" in "PowerFractals." 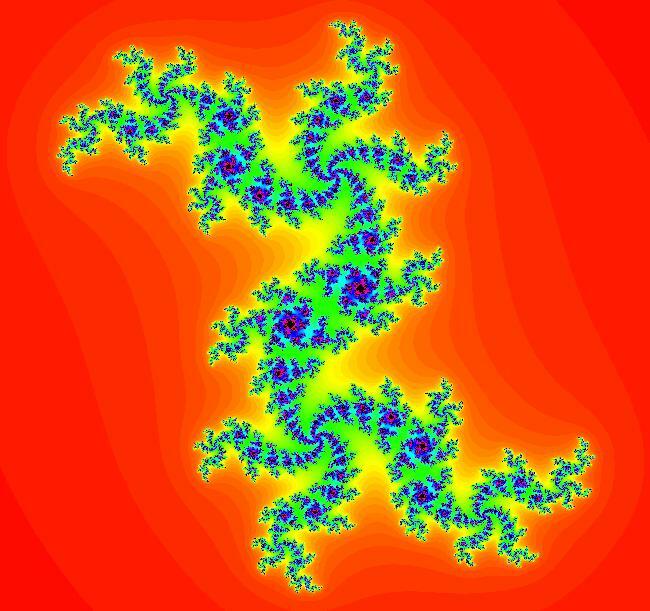 View/Sys/Gal: EMap "z^2+c: (2Mbar) EMap tail" in "PowerFractals." This is a series of zoomed-in images. Image 2: Image 1 zoomed in 1X. Image 3: Image 2 zoomed in 1X. 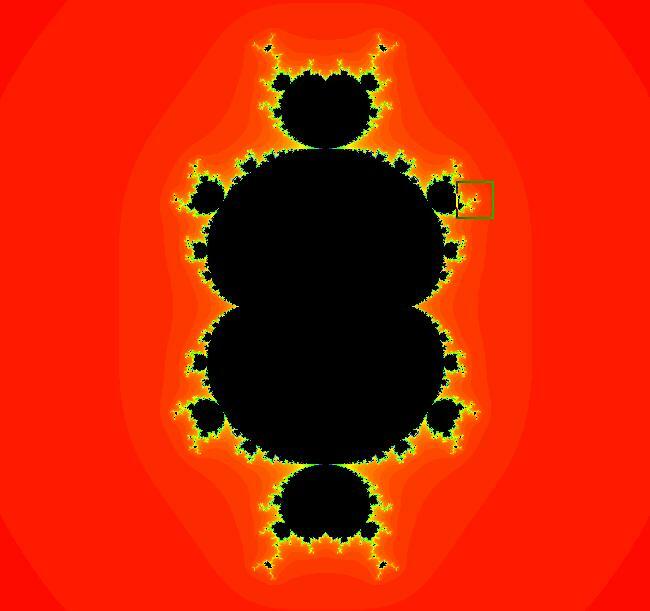 In image 3, the small black region on the left is quasi-similar to the Mandelbrot set and the small right most black region is quasi-similar to the Mbar set itself. 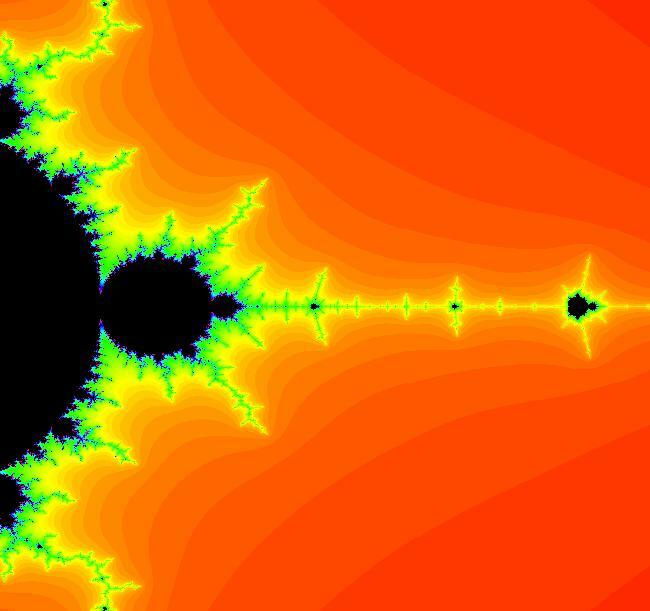 View/Sys/Gal: EMap "z^2+c: (3J) (F,-G) EMap" in "PowerFractals." 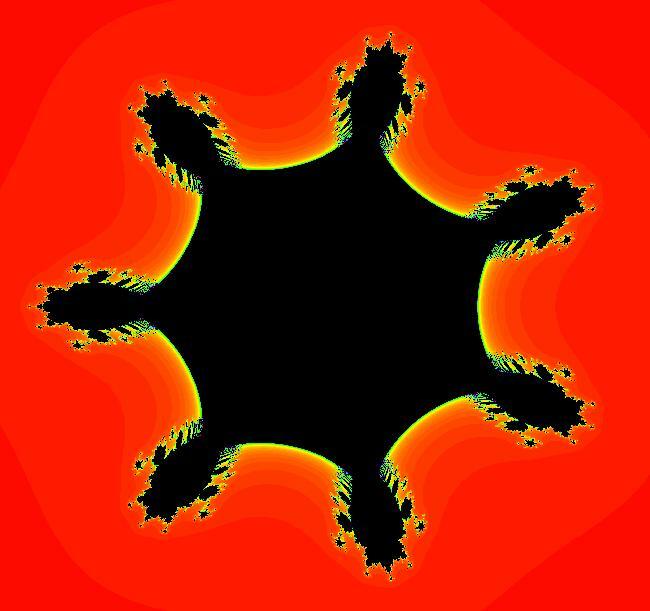 View/Sys/Gal: EMap "z^2+c: (3Mbar) EMap" in "PowerFractals." 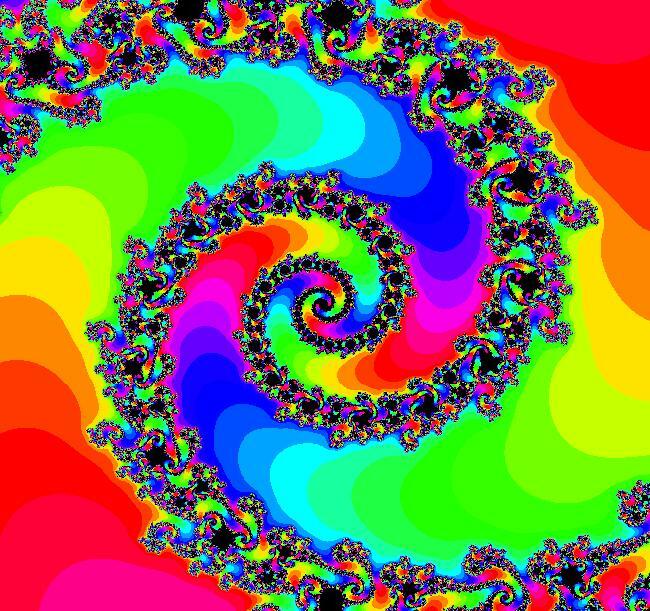 View/Sys/Gal: EMap "z^2+c: (4J) (-F,-G) EMap" in "PowerFractals." 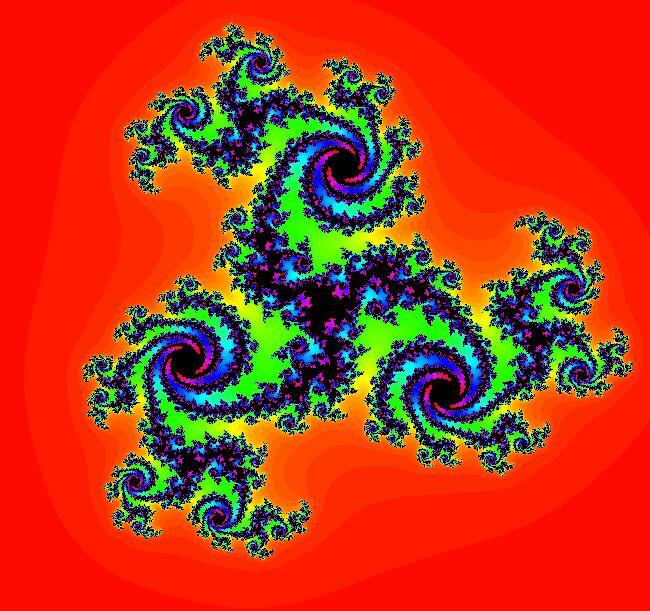 View/Sys/Gal: EMap "z^2+c: (4M) EMap" in "PowerFractals." 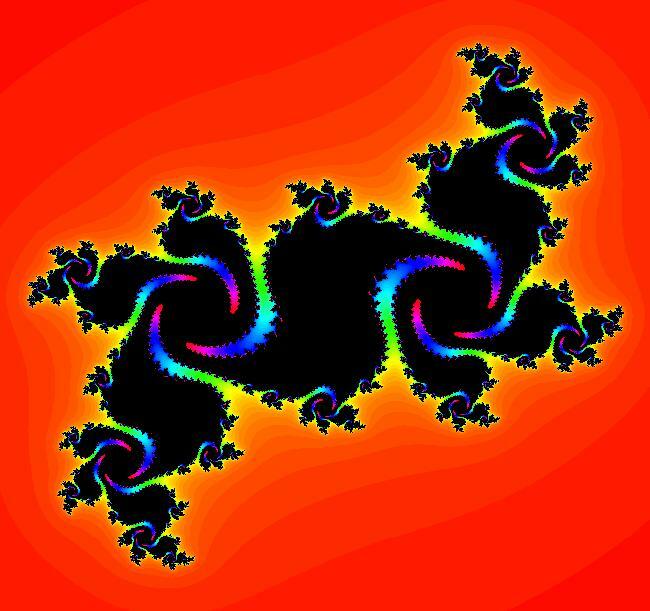 View/Sys/Gal: EMap "z^2+c: (4M) EMap tail" in "PowerFractals." 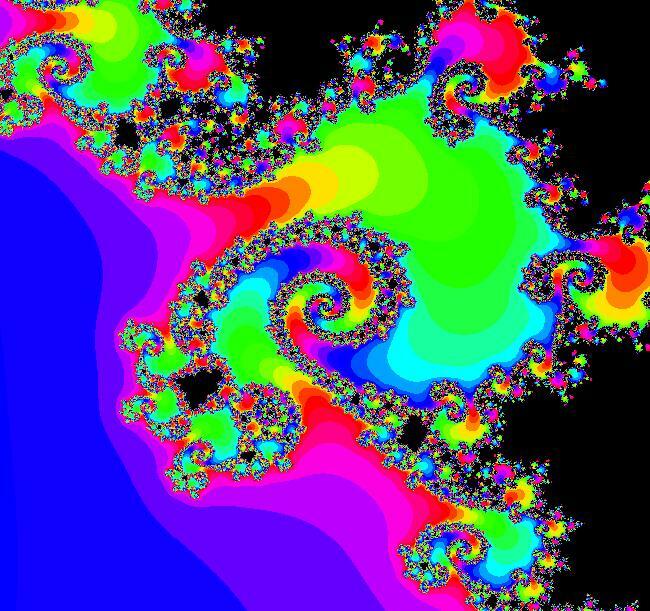 View/Sys/Gal: EMap "z^2+c: (5J) (G,F) EMap" in "PowerFractals." 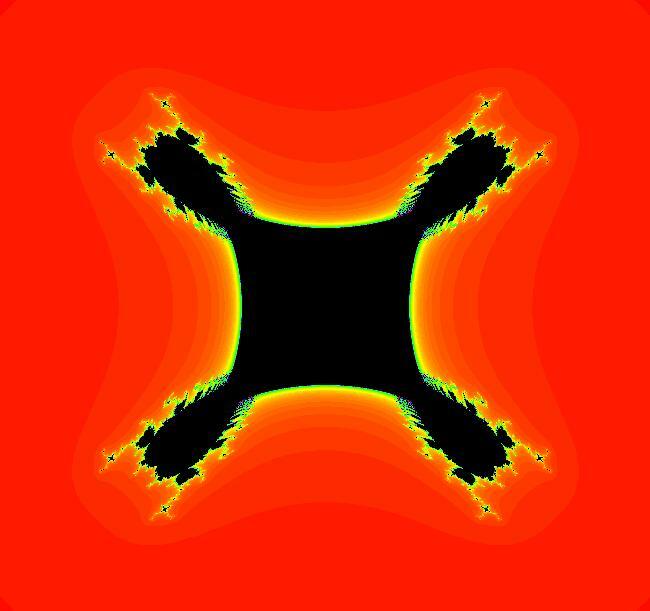 View/Sys/Gal: EMap "z^2+c: (5Mbar) EMap" in "PowerFractals." 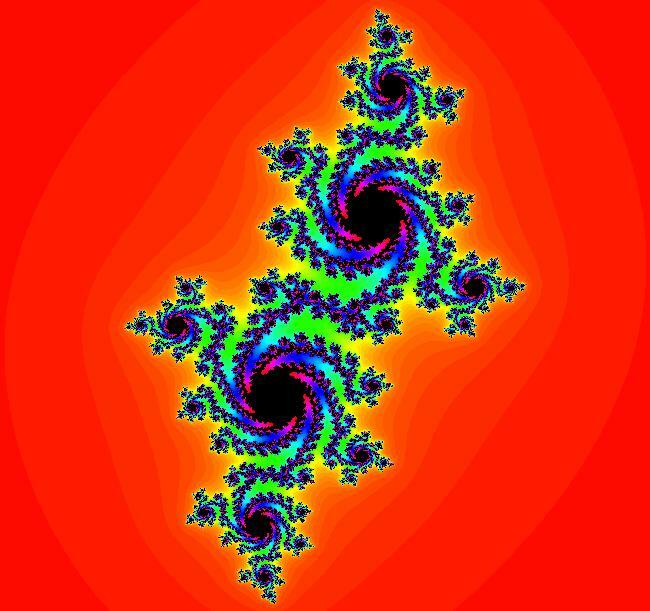 View/Sys/Gal: EMap "z^2+c: (6J) (-G,F) EMap" in "PowerFractals." 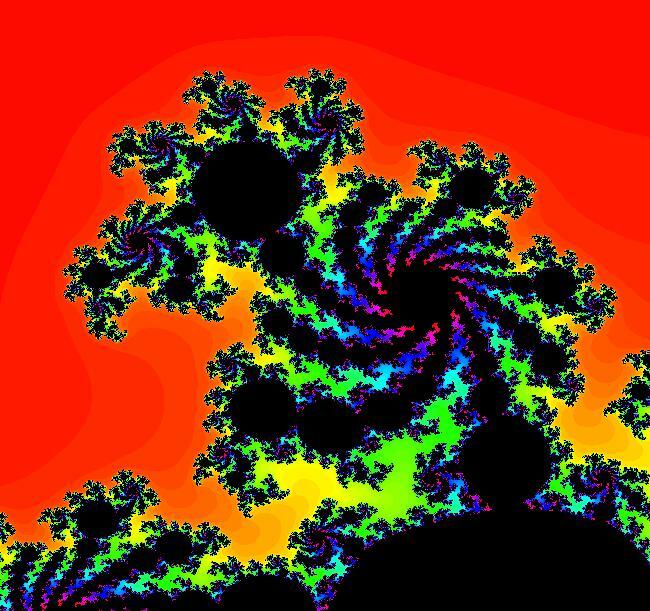 View/Sys/Gal: EMap "z^2+c: (6M) EMap" in "PowerFractals." 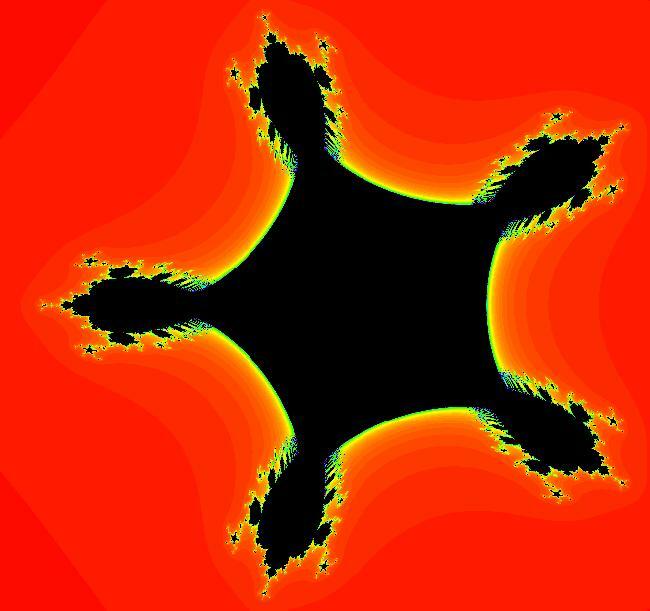 View/Sys/Gal: EMap "z^2+c: (7J) (G,-F) EMap" in "PowerFractals." 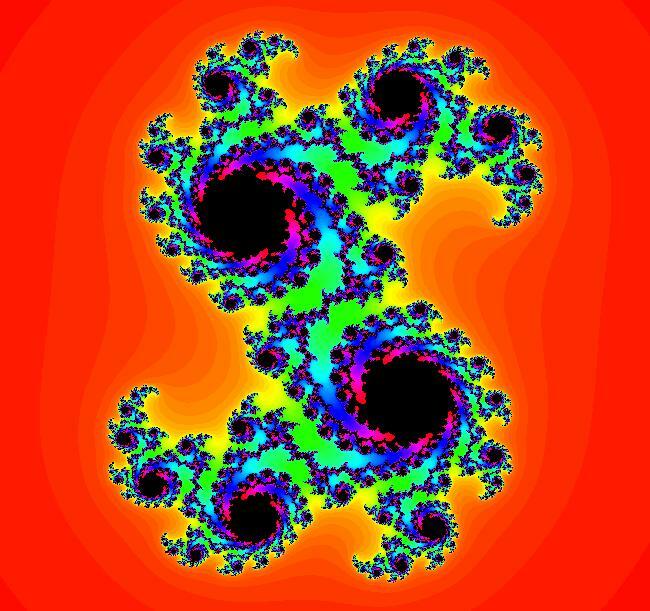 View/Sys/Gal: EMap "z^2+c: (7M) EMap" in "PowerFractals." 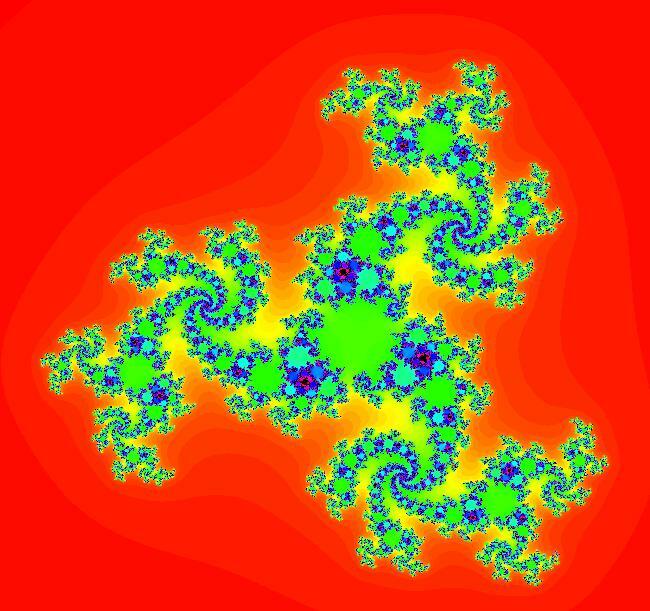 View/Sys/Gal: EMap "z^2+c: (8J) (-G,-F) EMap" in "PowerFractals." 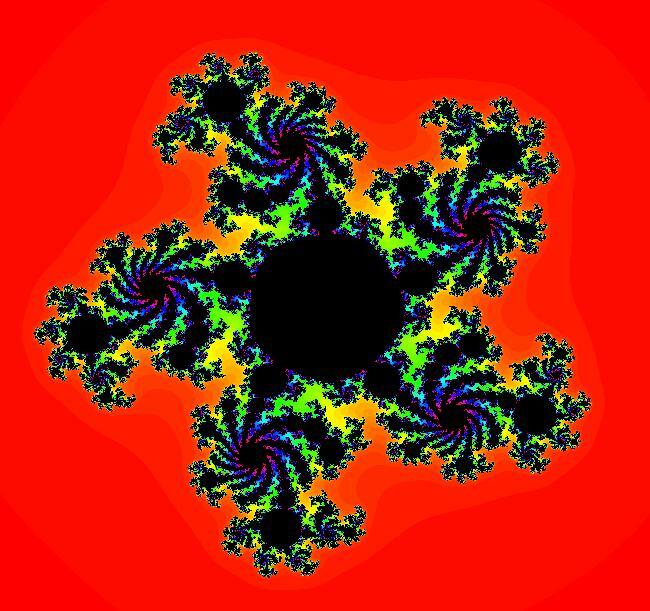 View/Sys/Gal: EMap "z^2+c: (8Mbar) EMap" in "PowerFractals." 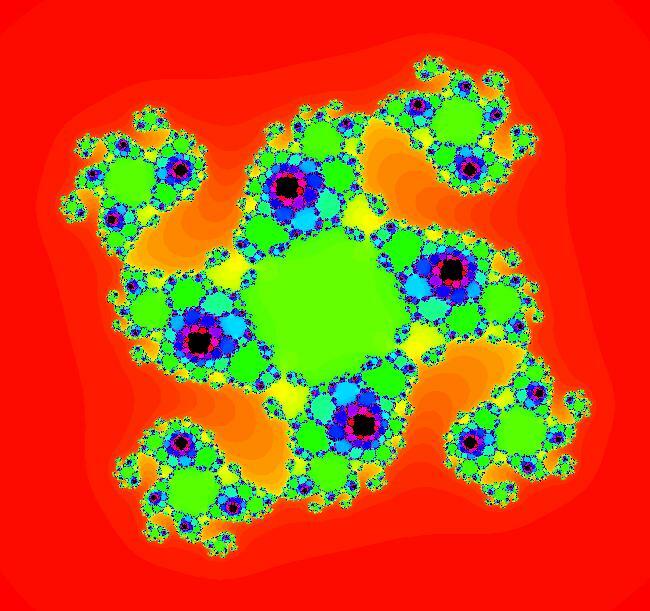 View/Sys/Gal: EMap "z^2+c: (9J) (a*F+b*G,c*G+d*F) EMapCT5" in "PowerFractals." Zoom in and vary the parameters. 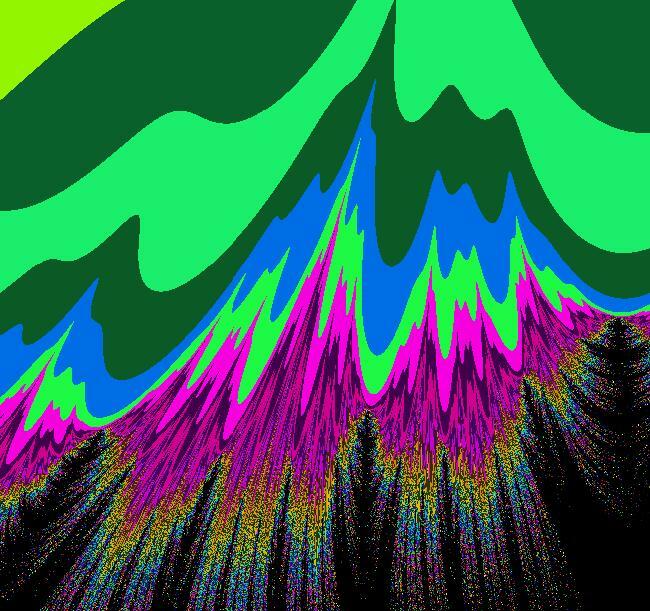 View/Sys/Gal: EMap "z^2+c: (9Jtrees) EMapCT5" in "PowerFractals." 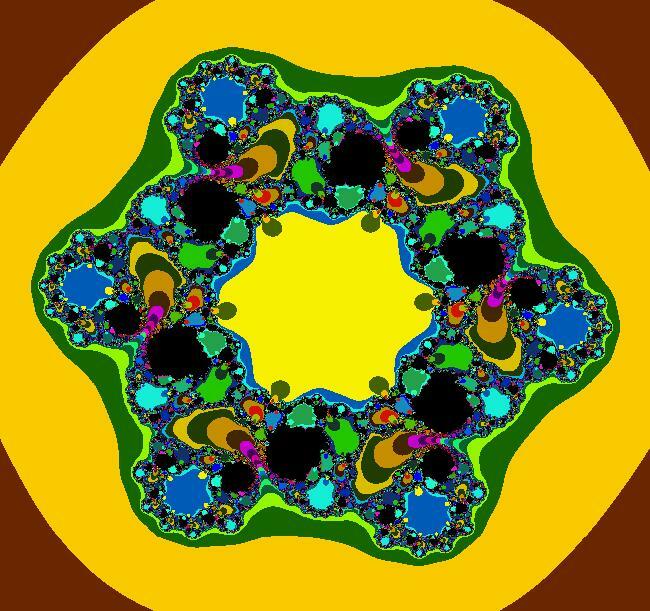 View/Sys/Gal: EMap "z^2+c: (9Mvar) (a*F+b*G,c*G+d*F) EMapCT5" in "PowerFractals." 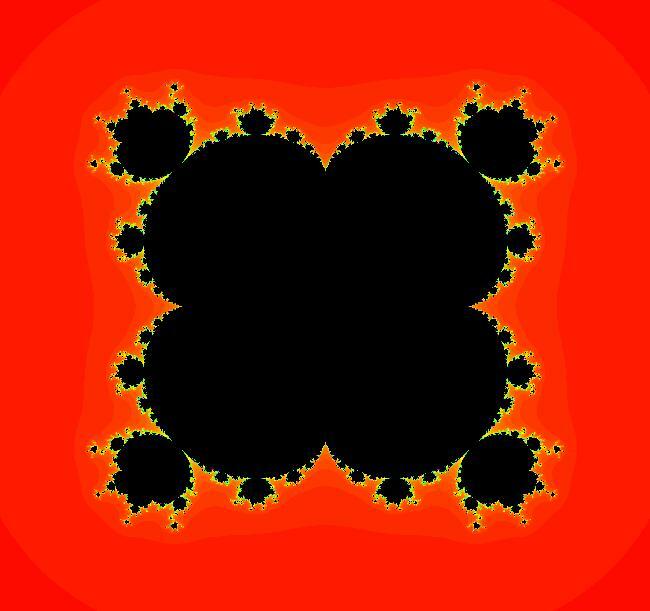 In this example, the Mandelbrot and Mandelbar sets are mixed. By varying parameters a, b, c and d you can go from one to the other.